Each of its solutions relies on the Apex Trajectory Cloud.™ This secure, cloud-based platform allows for device tracking in real-time. This dramatically reduces the cost of equipment repair and replacement, while increasing employee productivity. 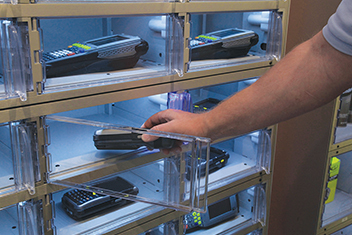 Eliminating wasted “walk and wait” time due to dead batteries and searching for lost and misplaced devices, self-serve, automated locker solutions from Apex are easy to set up thanks to their in-built Connect n’ Go™ technology, which allows easy installation within minutes.